Our machinery manufacturing unit specializes in fast delivery of Non woven Spunbond lines with customized structure design and ancillary equipments arrangement because we are leaner and quicker than other manufacturers. We are empowered with latest and modern infrastructural facilities that allow us to fetch out consumers’ requirements which is always increasing. Our varieties of Non Woven Fabric are Laminated, Printed, Anti static, UV stabilized and Fire retardant. Advanced machinery from the overseas production experience of our Company has been used in initial Non Woven Fabric Production appearance. 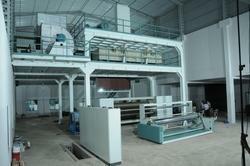 The site advantage is minor assets savings, compressed construction, smaller working area, easy production technology and operations with wide compatibility. • Superior knowledge and experience from far more than 1000 extruder processing lines put into production in previous endowment. and product know-how all from single source. Texti-eLP series is differentiated by its enhanced spinning system which includes optimized air process supply, optimized stretching and optimized lay down. Improved barrier property is achieved composite spunbond lines produce sandwich layer of improved spunlaid as support for melt blown layer. One of the fastest growing application and tremendous demand of PP non woven fabric created vacuum for indigenous machine in Indian market. 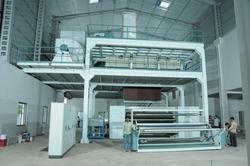 ELPIE has established itself by executing first of its kind 3.2 meter PP non woven Spunbond line of its Texti-eLP series. The Texti-eLP series of PP Non woven Spunbond lines offer various customized sizes ranging from 1.6 to 3.2 m fabric width with 12 -150 GSM for various Fields of applications like packaging, Medical and Personal hygiene etc. We keep changing our methodology according to market needs and customer requirements with very close eyes on serving quality. Today we are connected with many reputed customers based in India as well as outside India include UK, France, Dubai, Israel, Saudi Arabia, Oman and many other countries. Many customers are placing bulk and repeated orders that show the reliability and the quality of our products.Perfect engineering and vast experience in Extrusion field helped us to design Texti-eLP series to process industry's best specific throughput. (kg/hr)/meter. This will help the investor to have edge over others in the global competitive world. 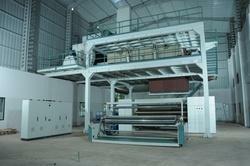 PP Non Woven Spunbond Line 1.6m. 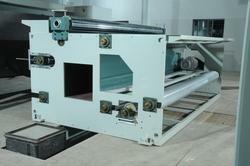 ELPIE is the only company in India that makes Extrusion processing line for various applications. Let it be small product like Tools for polystyrene foam products and PP/PS/PET thermoformed products or Big machines like PP Non woven Spunbond Lines, ELPIE has always offered superior quality products to the Industry. 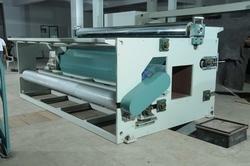 Looking for PP Non Woven Fabric Machine ?